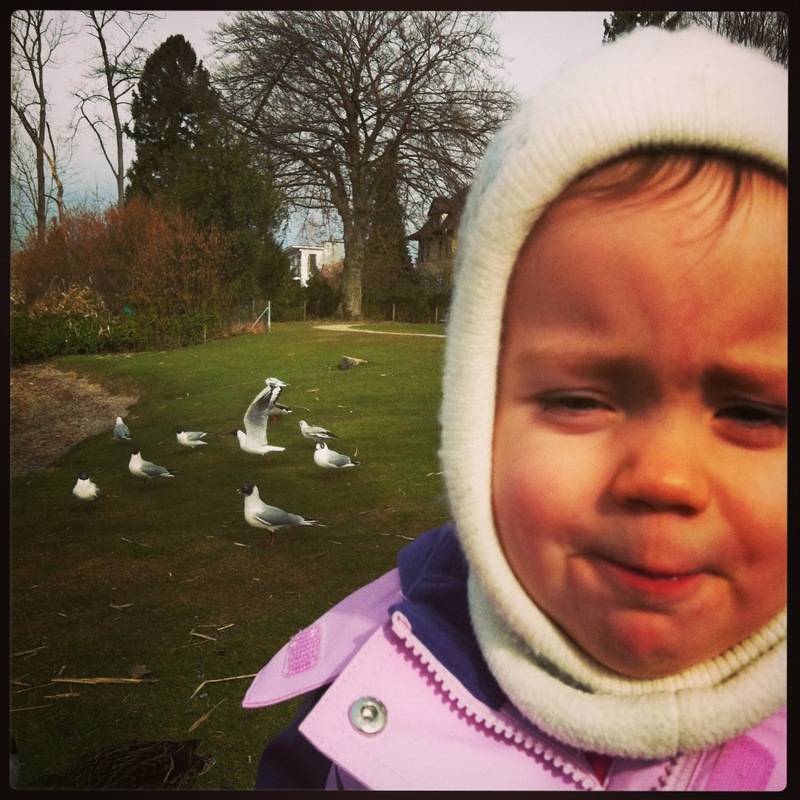 Mum is a bit tense these days… This morning we went for a walk and she absolutely wanted to feed the ducks. Luckily I got my hand on the dry bread, before she tossed it everywhere on the ground! I’ve munched as many pieces as I could and stored them in my cheeks. Mum even wanted to take them out again but I kept my mouth shut tight! I don’t get why she wants to waste good old bread to the birds?!!? Then, about 1 hour later, she wanted me to eat lunch. She put a plate of sweet potato mash, made with the rest of my yogurt I didn’t finish at breakfast (I had to leave room for the dry bread!). She thinks I’m stupid or what? She even used the SAME bowl as for breakfast so how obvious do you want it to be? Hello?!? She also made some ‘apparently’ very yummy cauliflower, snow peas and roasted tomatoes. ‘Apparently’ very yummy because she was eating it saying ‘yum’ ‘yum’ all the time. I get it, she thinks I magically like it because SHE LIKES IT! HAHAHA! At least she gave me a real fork and spoon with which I was practicing making very small pieces of the cauliflower and nicely distributing them all over the floor. She was trying to feed me the mash with another spoon, thinking I wouldn’t notice, but I did and said clearly: ‘NEI!’ (meaning no) but I had to repeat myself NUMEROUS times before she shouted at me, left in a huff and was red all over her face. Maybe that was from when I hit her on the eye just before lunch? This entry was posted in missing my sister, nam nam, simple daily stuff and tagged bread, Cauliflower, Cooking, food, fork and spoon, toddler eating, toddler feeding themselves, yum yum. Bookmark the permalink. Yes, it’s such a close journey between feeling elated, full of love for a child and then feeling overwhelmed.